Have you seen the gorgeous filigree/lace zippers that are starting to pop up for sale? I loved them immediately but wasn't sure best way to use them. 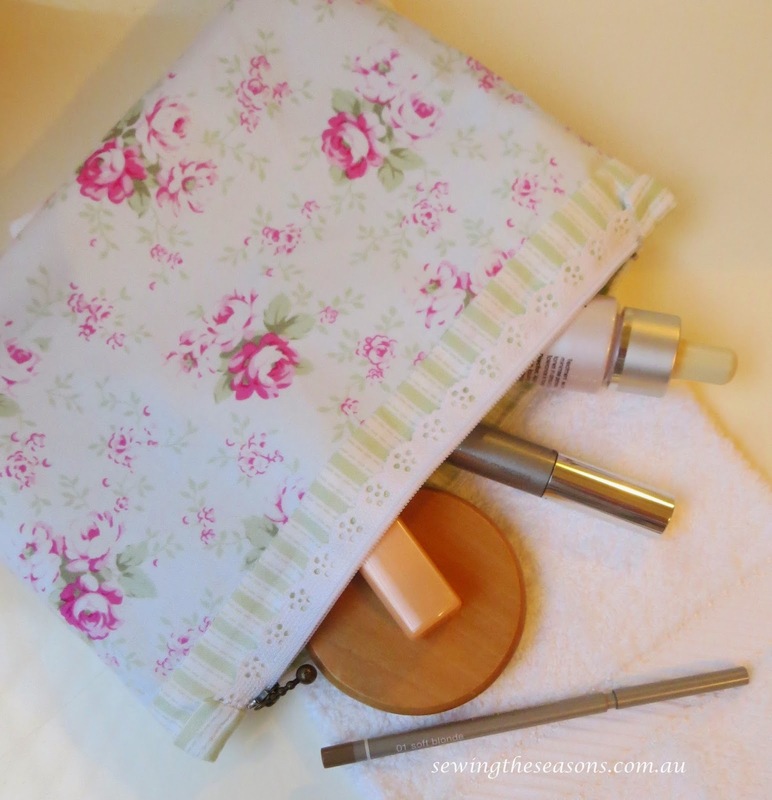 Then Leesa, the amazingly creative force behind SewBox Subscriptions asked me if I could write a tutorial using the zips as they were included in the February SewBox - this request got me thinking & the result was these pretty yet functional make up/all purpose purses. Filigree zipper - 20cm / 8"
Note - all seams 1/4" unless otherwise stated. 6. Press seam towards lining. give you a contrast strip at top of main fabric. iron to set interfacing piece in place. follow manufacturers instructions regarding iron setting. 8. Lift lining piece back out of the way, top stitch along seam where main fabric & lining meet. 9. Lay lining piece back down again, you will have two bag pieces ready to attach the zip. 10. Enclosing the ends of the zip. Lay zip right side facing up centred on the right side of one rectangles. Pin to hold into place. Lay another rectangle right side of fabric facing down & pin in place. Sew down each side with 1/4" seam, taking care not to catch edge of zip. Switch to zip foot & stitch across rectangle as close to end of zip as possible. Trim corners & turn through. Repeat for other end of the zip. Mark the centre of the zip & the centre of the pouch (at the edge of the top). Carefully pin the zip in place - the teeth of the zip should be off the edge of the fabric. needle down position, lift foot & slide zipper closure out of the way so you ensure you stitch in an even line. Pin zip to the other half of bag, lining up edges & stripes of top band. Sew down 2nd side of zip. Trim off the excess fabric from the rectangles at each end of the zip. 12. Side & base seams. Pin bag together, matching outer bag pieces & lining pieces. Take care to match the edges of your top fold (they will sit towards main bag side - left in picture below near finger) & the centre fold of the zipper strip should sit towards the lining (right of seam in picture below) to ensure a neat finish when turned through. Stitch around the bag, leaving a 4" opening in the middle of the lining. Mark a 5/8" square at all 4 corners of the bag, measuring in from the seam line. Cut out each of the corners. Align the two seams together, pin & stitch with a 1/4" seam. Turn bag right side out, carefully pushing out the corners. Either slip stitch or machine stitch (as close to fold as possible) the turning gap closed. Gently push lining into bag, making sure you push the ends of the zippered section out to give a neat finish. Take a moment to enjoy your finished bag. Quick & easy - stitch side seams & base then use your overlocker to neaten. Add the boxed corners & neaten the seam on your overlocker. You will need to run the ends of your overlocker threads back into the seams. This does mean you can see the seams inside the bag. If you live in Australia, you too can receive a SewBox each month filled with different fabrics, patterns, sewing supplies or gadgets. Or if you are after some of these filigree zippers, why not pop on over to Fabric Direct to pick some up as Eve has a good selection of colours available. She also has a great selection of pretty fabrics that work well with the filigree zippers. Don't forget to pop on back & post a photo of your filigree purse if you make one. Awesome tutorial can't wait to make one, thank you. from Eileen McDargh may help you. And if you've not yet devoured Eckhart Tolle's great book 'The Power of Now', start there.